OF HOGS AND CHANGES IN INCOME OF INDUSTRIAL WORKERS TO CHANCES IN HOC PRICES. than the spring crop of 1938.
the larger pig crop in the spring of 1938 than in the spring of 1937.
cultural Economics, Washington, D. C.
ports on Income Parity for Agriculture. 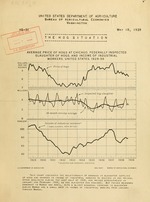 article on Income From Iio-s in 1939. 18 percent greater than the fall crop of 1937. Stocks of pork and lard on May 1 were about the same as on April 1.
and they were about the same as the 5-year average. : Mil.lb. 1il.lb. I l.1. Mil.lb. Mil. b. il.lb. than in March last year. by Great Britain, the leading foreign outlet for United States lard. be materially greater than in the current hog marketing year. reduction in hck marktinrs, however, is likely during the late summer. period also are shown in figure 2 on the second page of this release. Central States increased considerably more than in the West North Central States. than in the East North Central States. whole the cash farm income from hogs was 76 percent more in 1937 than in 1933.
: 1,000 dol. 1,000 dol. 1,000 dol, 1,000 dol. 1,000 dol. the 19.-4-37 average pig crop was about 17 percent less than the 1929-33 average. both the smaller supplies and the improved de-.L.d, hog prices rose materially. ceived for hogs were considerably higher than in 1933.
i/ Bureau of Arn:.al r.dustry. : : Oct.-Sept. : t *-Apr. ceived by farmers ....s do. Loins, 8-10 lb. ....: do. No.1, 10-12 lb. ....: do. dry cured, 6-8 lb. .: do.